Butter lettuce is a variety of butterhead lettuce, known for its smooth, loosely bunched, tender leaves. 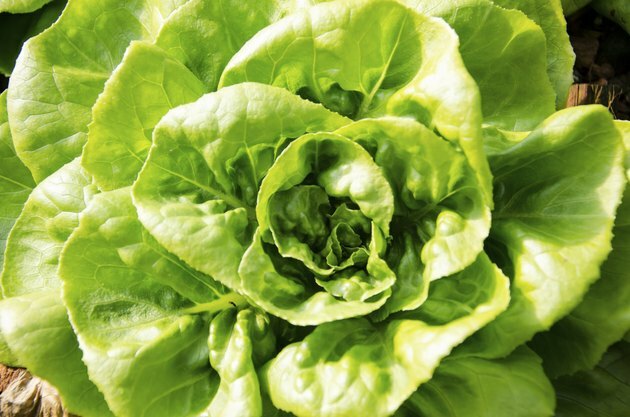 Because of its delicacy, this heading lettuce is often kept in plastic clamshell containers in grocery stores to protect it from accidental bruising. Useful in a number of dishes, butter lettuce is rich in nutrients and can easily be added to salads, sandwiches and wraps. The delicate leaves can also be used to wrap other foods, creating a low-carbohydrate wrapper rich in nutrients. As butter lettuces are frequently quite small, you may decide to use the entire head for a meal-sized salad. Alternatively, you can mix the lettuce in with other types of vegetables or leafy greens. A 1-cup serving of cut-up butter lettuce contains only 21 calories per serving. With less than half a gram of fat, 3.63 grams of carbohydrate, 0.74 grams of protein, 1.53 grams of sugars and only 8 milligrams of sodium, butter lettuce is a low-fat, low-calorie, low-sodium food choice that is nonetheless rich in other nutrients. A 1-cup serving of cut butter lettuce contains 91 micrograms of vitamin A per serving. As an antioxidant, vitamin A helps your body protect itself from damage from environmental toxins as well as free radicals. A fat-soluble vitamin, vitamin A is necessary to produce as well as maintain healthy skin, soft tissues, mucus membranes, teeth and bones. According to MedlinePlus, the recommended dietary allowance for vitamin A for adult men 14 and older is 900 micrograms, while for women the amount is 700 micrograms. Vitamin A, also known as the clotting vitamin, is essential for clots to form in your blood and may help to maintain healthy, strong bones -- especially in the elderly. The daily requirement for vitamin K is most commonly reached through diet, and leafy greens such as butter lettuce are rich in vitamin K. A 1-cup serving of chopped butter lettuce contains more than 56 micrograms of vitamin K. The recommended dietary intake for potassium for adults over 19 is 90 micrograms. Phosphorus can be found in every cell in your body, and because of its prevalence, it makes up 1 percent of your entire body weight. Phosphorus is used primarily to produce and maintain healthy bones and teeth. It also helps your body make use of carbohydrates and fats, as well as supporting your kidneys, enabling your muscles to contract, helping your heart beat normally and assisting with basic nerve function. A 1-cup serving of chopped butter lettuce contains 33 milligrams of phosphorus per serving. The recommended dietary allowance of phosphorus for adults is 700 milligrams.